It's a jungle out there on the roads and car paint chips are a reality of life. Just like cars, paint chips come in many forms and sizes. As a car detailing professional, I can tell you that now you have more options than ever. As a professional, I can also tell you that the right tool is often the key to superior results. 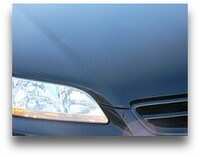 This is also key for car paint scratch and chip repair. As car enthusiasts looking to enhance our cars, or someone looking to simply retain the value of your car, repairing the paint chips and scratches is a big step towards the overall beauty and value of your car. You simply don't realize how much all those tiny little paint chips detract from the beauty of your car. You simply don't realize how much better your car will look by doing something as simple as filling and repairing those paint chips in your car's paint. Many of you have tried the car touch-up paint from the dealership only to get poor results. Most of you do not know of the latest paint chip and scratch repair kits available. While most people would recognize how a combination of the "good" kind of details enhance the overall look and value of your car, the combination of the "bad" kind of details has the opposite effect. Car paint chips, miscellaneous broken items, dull paint, dirty wheels, etc., etc., all combine to bring your cars beauty down; and down goes your love and concern for it. The cycle then starts, which only produces more of the same bad results. By taking time repairing the miscellaneous scratches, surface marks, and road rash, restore the beauty and value of your car, while at the same time restoring the love affair with your car! As you can see in the pictures above, the results are dramatic. Imagine the ability to do this same type of quality repair on the front facing edges of your own car! As I said before, most of you do not know about the latest in do-it-yourself road rash and paint chip repair kits available on the market today. Freeway driving is a killer to your paint and will create the dreaded road rash syndrome; hundreds of tiny chips on all forward facing edges of your cars paint. No longer do you have to rely on your un-steady hand and the old school touch-up applicators which leave your hood covered with colored "bumps". Dr. ColorChip's repair process produces a smooth, perfectly matched paint with no paint blobs! High quality automotive paint and a proprietary blending solution fill and hide paint blemishes in two simple steps. Say good bye to this form of car paint chips. This kit is a custom order kit where you enter your exact make, model, and year of car for a kit made precisely for your exact color of car. Kit comes with everything to treat the unsighlty and dreaded road rash that every car eventually gets. You will be amazed at how much better something that seems so trivial, can make your car look. Once you open the window into Amazon, just enter the specifics of your car. This kit does NOT contain the actual paint. This kit is intended to use with the factory touch-up paint you get at the car dealership. This kit is designed to create a "blob-free" fix with the factory touch-up paint. The next thing on our list is the miscellaneous scratches that will be found on your car. For any deep scratches that have gone down to metal or well below the clear coat, the Dr. ColorChip kit from above will be your answer for these heavy duty scratches. For all the hair-line scratches that really have no room for any form of touch-up paint as they are so fine and superficial, then the kit below are your solution. Yes, there are scratch removal compounds that are sold, but they are only good for the finest of scratches that have zero edge to them. For any hairline scratch that you can catch any type of edge with your fingernail, but are confident it has not gone through the clear coat, the 3M kit below is your answer. Do what I call the fingernail test: see how much of an edge you can catch with your fingernail as you drag your fingernail across the scratch. The more significant the edge is, the less likely you will be able to remove completely. But with that said, you can still sand and polish the edges off so you are often able to diminish the appearance of the scratch even if full removal is not possible. This kit works best when used with a drill motor as it greatly speeds up the process. If your car suffers from the road rash syndrome, use the Dr. ColorChip repair system or the Langka system with the factory touch-up paint. If you have deep, all the way through to the metal, type of scratch that has an actual valley or some width to it which you could realistically lay some touch-up paint into, go with the Dr. ColorChip repair system. If you have the very fine, hairline scratches that are individual scratches that you can either NOT catch an edge with your finger nail, or barely catch and edge with your finger nail, then the 3M kit is your ticket to removing these type of scratches. Here I am using my professional car paint chip repair system. Not appropriate for you, but as a professional that performs this service on a regular basis, it performs great! 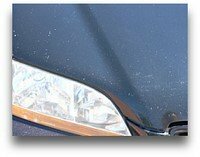 I hope the info and tips here will help you not only repair those car paint chips, but increase the overall appearance of your car. After all..the difference really is in the details. And having unsightly chips and scratches on your car are the kind of details that diminish the overall value and appearance of your car.